New Delhi: China has been upgrading its military as well as dual-use infrastructure in Tibet, especially in the areas bordering India since the Doklam stand-off. From changing its logistic systems to building a new expressway between Beijing and Lhasa, to even constructing a possible heliport, there has been a tremendous amount of Chinese activity in the ‘autonomous’ region. It’s also difficult to monitor this activity, because open-source satellite imagery is hard to come by. 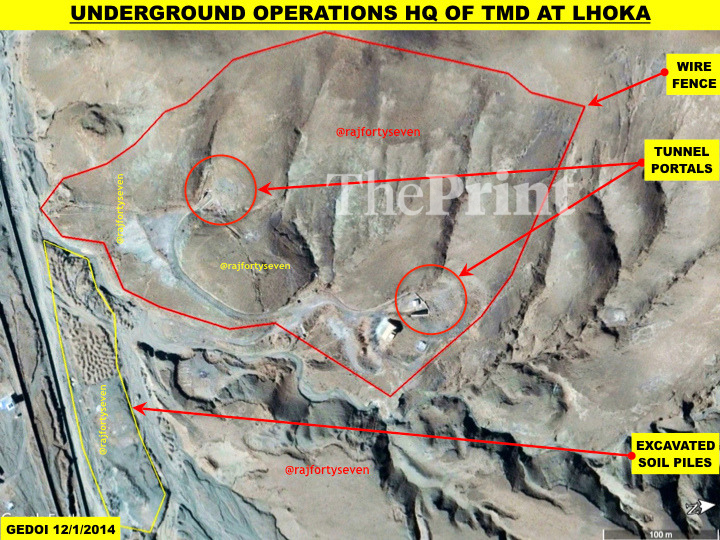 However, the most recent images accessed by ThePrint indicate that China has been upgrading its underground facilities (UGF) at Lhoka, also known as Shannan, a small settlement that has now become a large military town where the People’s Liberation Army and the People’s Armed Police are based. Lhoka, a sleepy town until the late 1990s, came abuzz in 1998 when the military units started moving in. Since then, it has witnessed tremendous growth in military infrastructure every year. The town also accommodates units and headquarters of the artillery brigade of the Tibet Military District (TMD). The units in this area are supported by two UGFs tucked into the mountains on either side of the road passing from Lhoka towards the Indian border in the Tawang sector of Arunachal Pradesh. 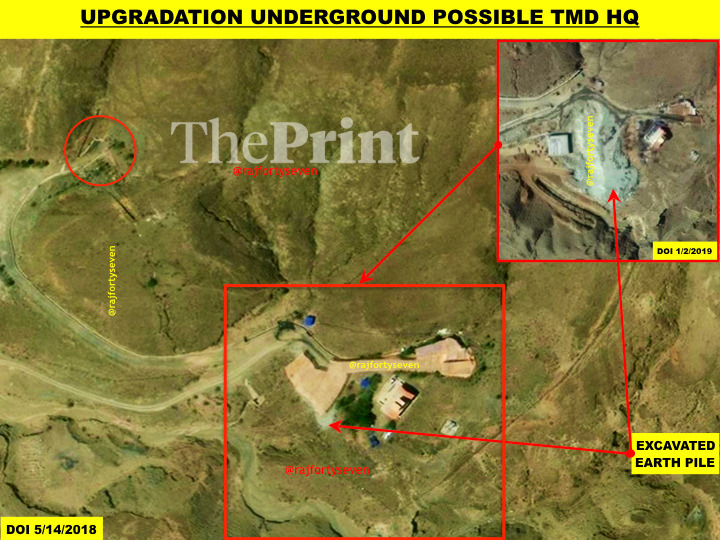 The one west of the road (UGF-1) possibly stores ammunition, while the one on the east (UGF-2) is possibly the operational location of the TMD headquarters. UGF-1 was constructed around 2004. It is a cut-and-fill type facility, with two bunkers of 20m x 15m size, separated by a distance of 165m. The facility has been provided a high level of security, with four access control layers. There are two security fences, with the outer being a wire fence and the inner a tall, solid fence. It has support buildings overground, possibly for accommodating guards and qualified troops to handle the specialised equipment. 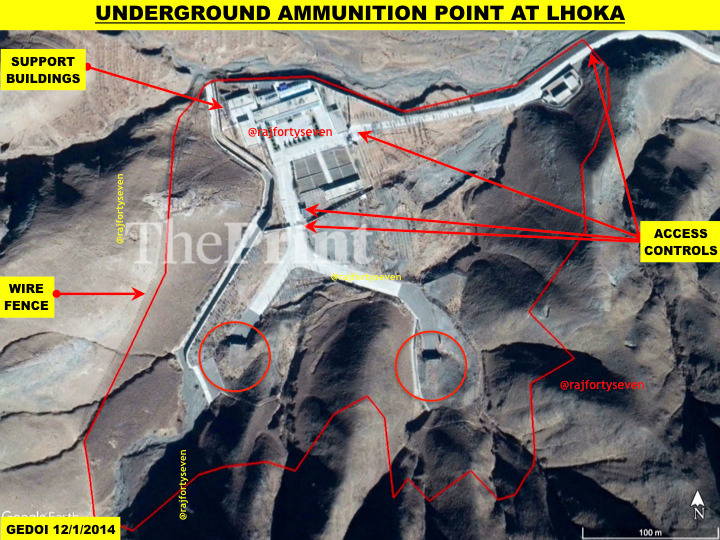 It is assessed that these two bunkers could have either artillery ammunition or some kind of missiles. 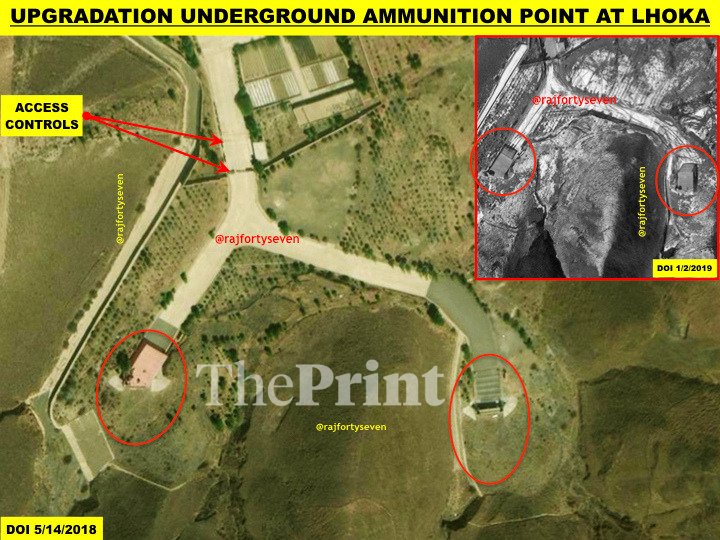 Recent images indicate that the two bunkers have been upgraded with a protective cover ahead of the entrances — of almost the same size as the bunkers — to avoid any direct hits. The facility was unusually low on activity until 2017, and has seen a lot of activity since then, especially in the winter of 2018. The construction of UGF-2 began in 2008, and it was completed in early 2010. It also looks like a cut-and-fill type facility from the outside, with two entrances for two bunkers. But the amount of earth excavated indicates a massive underground structure — it has been disposed of at more than four locations, which makes it difficult to obtain an exact measure. However, a rough estimate indicates that UGF-2 possibly has a volume of almost 50,000 cubic metres, which can easily accommodate the operational headquarters of the TMD. The facility has been provided with double access control and a single wire fence all around. UGF-2 became active in 2017, during the Doklam stand-off. The eastern entrance 2 was seen under temporary shelters to evade detection of any activity. Tunnelling activity began in November 2017, and excavation was observed by April 2018, when almost 85m of the path towards the entrance was covered with a temporary structure. The freshly-excavated earth is piled at two locations, which indicates further widening and deepening of UGF-2. The upgradation of both the UGFs indicates that this area remains a priority for the Chinese military.